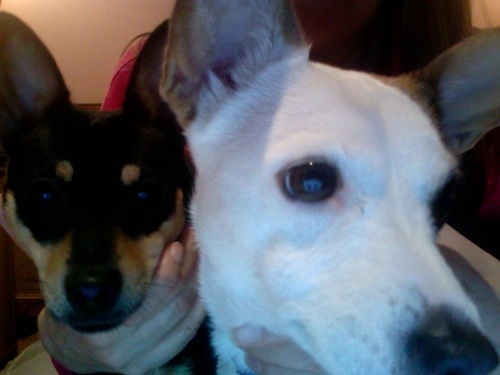 Lexi & Mindy – Two Lapdogs One Lap! Mindy loves to sit on my lap when I am working on the computer every morning. She will even sometimes fall asleep! It’s a nice time to bond with her. Since Lexi has been doing very well with her house training, I have been leaving her out of her crate in the morning, and she usually finds an old bone to chew on, but she usually hangs out in my office. Sometimes, she begs to sit on my lap too. She loves to watch the laptop screen, the cursor moving or the colors moving around. It’s so cute to watch her fascination with the screen! But since she is still young and energetic, she only stays on my lap for a short while, before she wants off! Well, this morning, Mindy came up on my lap for a few minutes, then it was Lexi’s turn for a few minutes. Then shortly after, Mindy AND Lexi both were begging to sit on mama’s lap at once. I decided to give Mindy a turn, and petted Lexi while she sat on the floor. 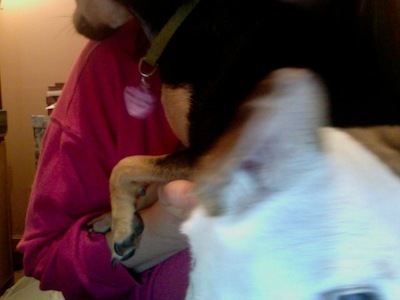 Well, that wasn’t good enough for her, she leaped up and landed on my lap on top of Mindy! aaacch! It was so funny. 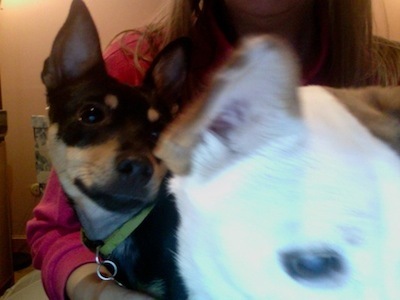 I had two small dogs battling it out on my lap! I scrambled to try to launch “Photobooth” so I could take a photo of the situation! And here is one of the better shots! It was hard to keep them still in front of the camera! This entry was posted in Lexi, Mindy, photos, Terrier Behavior and tagged dogs, fun, Lexi, Mindy, photos, Rat Terrier. Bookmark the permalink.